RHY Clearinghouse Launches New Website, Blog! On Point will bring you updates on what’s happening in the field. We’ll also share what we know about tools, resources, opportunities, research, and best and emerging practices that can help you do your work more effectively, more efficiently, or both. We’ll point you to resources both on our website and elsewhere. In this first issue of On Point, we’d like to introduce the new Clearinghouse website and show you how what you’ll find there can help you every day! 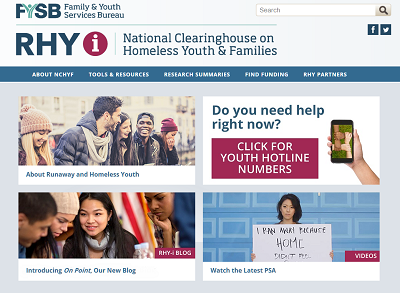 Since NCHYF was established in August 2017, we’ve been hard at work making our website the go-to destination for all things related to runaway and homeless youth resources. We’re building on the foundation created by the former National Clearinghouse on Families & Youth and are expanding our slate of features to better serve the new Clearinghouse’s exclusive focus on runaway and homeless youth. From the navigation bar on our home page, you’ll find links to the main sections of our website, including Research Summaries, Funding Opportunities, Tools and Resources, and RHY Partners. From four prominent tiles immediately below the navigation bar, you’ll find our blog page, information about runaway and homeless youth (a good place to point community members to to learn more about the issue), a link for youth who need immediate help to get in touch with the hotlines established to assist them in addressing their most urgent needs, and to videos in our video collection. Below the fold, so to speak, you’ll find a calendar of upcoming conferences, webinars, and other events you might be interested in and can see what we’re tweeting about on social media. We hope you’ll take the opportunity to browse our new website and offer any comments or feedback on what you find there. We have more content and more feature sections in the works, so we urge you to come back often to see what’s new. You can also visit our Subscribe page to sign up to receive On Point and other important announcements from us. We’re committed to bringing you the information you need to help you serve the kids who need your help. If you have suggestions or questions, you can reach us toll-free from 8:30 a.m. to 5:00 p.m. EST at 833-GET-RHYi (833-438-7494) or by email: GetRHYi@NCHYF.org. We look forward to working with you to support homeless and runaway youth.